The Cooper Union logo represents the union of science and art in its multidimensional complexity. It celebrates the tension as well as the synergy, the harmonic imbalance as well as the explosive creative potential implicit in any such union. Conceived and presented in 2009, the “box kite” logo was developed by Doyle Partners, the design studio of alumnus Stephen Doyle (A'78). 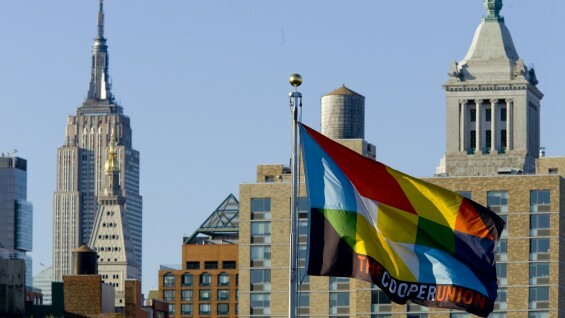 The Cooper Union logo represents the convergence of architecture, art and engineering—the three disciplines of our flagship schools that together constitute the organization. The logo is rooted in logic. If you draw a C or a U as a square form, you would arrive at our basic module: three planes that intersect at right angles. If you twist the U one rotation, its three planes would complement the three planes of the C, creating a perfect square, an ideal geometric form, useful in engineering, art and architecture. We have allowed our planes to intersect just at their points, and we have encouraged them to be transparent. If each half were thought to represent art or science, notice that each is comprised of three elements. Those could represent each school. If that were true, which it probably isn’t, then each school would have a foot in both science and art. The three primary colors are the genesis of all colors, and this little baby looks really cool when it spins. Much attention has been paid to this logo on design blogs. One of the “criticisms” noted is that it resembles a box kite. Made of wood, paper and color, a box kite is something that, with a little wind, lifts itself up proudly into the air, and can spend the day there, floating overhead, tethered to earth with just a piece of string. Like our Alma Mater, it simply defies gravity. Read more about the logo on The New York Times blog.